Watchmen of the Galaxy star Dave Bautista has shielded James Gunn after the movie's executive was shot over hostile tweets. Gunn apologized after old tweets in which he seemed to joke about pedophilia and assault were uncovered and broadly shared on the web. He was expelled by Disney on Friday as chief of the establishment's third portion, Guardians of the Galaxy Vol. 3. 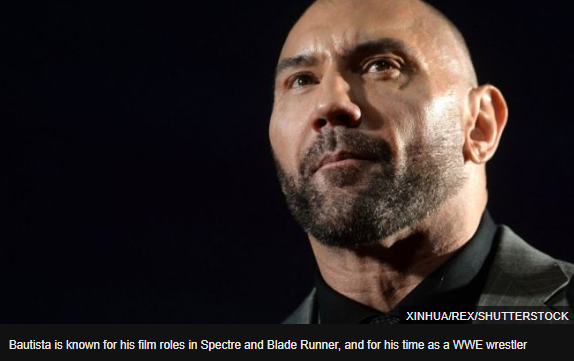 Bautista, who depicts Drax the Destroyer in the movies, has taken to web based life to state he is "not alright" with the choice to sack Gunn. Bautista's post has ended up being disruptive via web-based networking media, with a few people extolling the on-screen character for his position, while others were more basic. On Reddit, Bautista was named "a really decent person" in a prominent post adulating him for being "willing to stick his neck out and shield Gunn". Others called the assault "a politically persuaded bring down" where "you can lose a considerable measure for being disparaging of the president" - referencing Gunn's allegation that the US pioneer submitted "injustice". In any case, others oppose this idea. One Twitter client inquired as to why Gunn did not erase the tweets on the off chance that he never again concurred with them, while another said that his remarks were not "clever or adequate in any conditions". Bautista isn't the main Hollywood performer to have stood up with regards to Gunn. David Dastmalchian, who plays Kurt in the Marvel Ant-Man films, already worked with Gunn on his 2016 loathsomeness spine chiller The Belko Experiment. In spite of the fact that he didn't specifically address the debate, he posted a photo of himself with Gunn on Instagram and called the chief "a standout amongst the most stunning individuals I've ever known".